CLC or Chemical Looping Combustion is a great technique for separating nitrogen from carbon, but there are still some rather large problems that need to be solved. The biggest pilot plant I know of is at the Technical University of Vienna, a 120 kw thermal plant (pdf presentation of first operational experience). When using CLC to replace a conventional combustor, you would expect it to be placed between the compressor and expander of a gas turbine, which necessarily means it operates at pressure. Operation at pressure is something nobody has yet demonstrated. Although it has been demonstrated thermodynamically that operation at pressure is the way to make this system more efficient than other decarbonization techniques. Also the metal oxide really needs to be hot (really hot 1200°C) to give an efficient process. I have seen no convincng evidence of these materials operating at such temperatures. Cu is normally used between 800-900°C, and Fe, Ni and Mn (the other materials usually associated with this technique) around 900-1000°C. These are the temperatures at which stable operation under atmospheric pressure have been demonstrated. 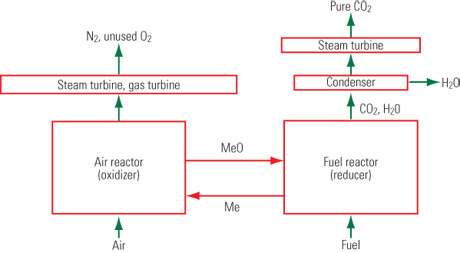 There are of course ways you can increase the temperature of the gas at the turbine inlet, but that would require mixing in other decarbonization techniques such as oxyfuel, which requires solving the problems associated with that technology too. See for example page 8 in this presentation and you notice the almost hidden (and apparently optional) addition of fuel in front of the gas turbine. Another problem is dust. The gas really has to be cleaned up extremely well before entering the turbine, which requires hot (very hot) filtering technology that still need to be developed. Ni dust is really quite nasty stuff. Your link points at CLC with coal, but that will almost certainly have to run at pressure and high temperature to beat gasification as a first step in the techological chain for removing CO2. The only metal that would be suitable for coal as far as I can tell is Fe, because it's cheap and there will be a need to replace a lot of the stuff as it accumulates junk from the coal. The beauty of these sort of systems is that adding fresh material and removing the stuff that isn't working any more is relatively simple and can be done on the fly. Just a small point, the schematic is incorrect in that the expander of the steam turbine on the right hand flow would take the whole CO2/H2O flow, before condensing. Not putting the steam through a steam turbine is a waste of a steam turbine. I doubt that using that heat to preheat some other process steam would make the process more efficient that changing that heat and mass flow directly into extra power. Be sure CLC will find a market segment, but as I've said here before, don't get sucked in by the Utopia presented by some of the people working directly on these technologies. Obviously a lot of problems here, but the concept is sweet, a bit indirect but right on the mark. The guy who talked to me about this is working on making it go with powdered coal. Eli's first question was "why don't you gasify the coal first? The response was that, yeah, that would be simpler, but if they could make it work with coal and then separate the metal from the ash it would really cut costs. Since turbine efficiency is really high for electrical generation (btw 50 and 60%?? ), at least 10% higher than boiler operation this doesn't look like a sure thing. Don't get me wrong, most the decarbonization scheme out there are a long way from demonstration and still have a lot of ground breaking research to be done. In the short term, post-combustion and oxyfuel are the most like to be implemented, but pre-combustion (except maybe with amines) is something for the future. CLC is a neat idea, and it should eventually find an application in power generation with capture. There's so much junk in coal I can't imagine anyone wanting to let it touch anything but the cheapest of oxygen carriers, like raw low-grade iron oxide ore. Sulphur, oxygen, iron, calcium and silica (to name but a few) sounds like a recipe for once-through solid junk. CLC with gas out of the gasifier sounds much more sensible to me. As I recall the really big argument about controlling mercury emissions has been that capturing heavy metals will create a far cheaper source of heavy metals for industrial use than actually, you know, mining them out of other kinds of rock. Including uranium of course, that's the official excuse. But the competition it would create with other metal industries should also be considered. (3) burn biochar (about 98% carbon is possible) for process heat and the CO2 stream used in the first step. Leave dirty, nasty coal in the ground. There must be a thermodynamic loss here. The nett reaction is still C + O2 -> CO2 and there's only so much enthalpy you can get from that. If the reaction of Cu and O2 gives off heat, then that heat has to be subtracted from the combustion of C with oxide. It seems to me that Cu is rather expensive for this task. World copper production is about 14 million tons a year, and there's talk of peak copper. We burn gigatons of coal. Cu recovery would have to be almost perfect. Cyclone filtration, probably in multiple stages is established technology and can extract the vast majority of the dust. Depends upon density differential between fluid and solids. Can remove particles down to the micron range. Has the benefit of zero moving parts and no filters to replace or clog. If suitable, should be relatively straightforward compared with the rest of the process. These oxygen carriers are micron size particles. Think 50-250 micron. Cyclones are very much a part of the initial clean-up in these systems, but mostly are used for achieving the recycle. To get more information on gas turbines and dust loading you can start here. You could start by reading the last paragraph on page 3, and the first paragraph on page 4, second column. (If you don't want to read it all that is - be sure I didn't.) The study is 13 years old, but be sure that some gas turbine company didn't spend loads of money in the meantime developing new gas turbines that can take more solids. Remember the difference here is taking out the dust at much higher temperatures than for instance in IGCC, because your replacing the combustor of the gas turbine, not making a syngas for the gas turbine. There isn't a thermodynamic problem here. The oxidation of the metal is exothermic, and correspondingly, the reduction is endothermic, but the combustion of the fuel is exothermic. So you get hot air, depleted in oxygen, going to the gas turbine, and hot exhaust gases going to the steam turbine. The heat from the combustion is effectively split between two streams, instead of one. I think James Hansen has the best idea of all: Eliminate coal burning entirely. To those who keep speculating about ways to make coal burning work "cleanly", I would simply say: show me why that is necessary. "Clean coal" is a misnomer whatever way you look at it. It's not "clean" to mine and it's not "clean" to burn -- period. Let's do a back of the envelope calculation Dave. Current installed capacity in the UK, about 81 GW. (Sorry couldn't find a better ref). And say we're getting a average irradiation of about 150W/m2 on the ground (ditto). And say we can use 6.6% of the incident radiation for reducing the CO2 (ditto). And say we can use this fuel in a combined cycle with an efficiency of 50% (CLC above). All kind of thing wrong with this calculation but then how much area do I need for the UK. So lets start building tomorrow, how about Yorkshire. Shall we get even more shakey. Shall we assume a ground price of 10 pounds sterling per square metre? That's only 160 thousand million pounds to buy the land - if we let about two banks go bust, we can redirect some money, after all thats only 2 pounds per W.
Say these are our only costs and the equipment last for 50 years or about 400000 hour. That's 2000/400000 only 0.5 pence per kilowatt hour. That's an eighth of the price of coal generation. We'd be crazy not to. Alternatively, how about 2MW wind turbines, that's about 12 turbines/km2 if they achieve 20% average load and the cows and sheep in Yorkshire wouldn't give a hoot. Get your facts straight anonymous, Hansen is against new coal without CCS as we all should be. You are the person who introduced "clean coal" into this thread. Coal with CCS is better for the environment than coal without, period. we find the claim that 32,000 km^2 of New Mexico suffices for all of the US energy needs if used to grow algae. Leave the dirty, nasty coal in the ground. One of the reasons Eli prefers Fe is that you can separate it magnetically. As Bocco pointed out the question of efficiency is really one of detain, not for the overall process which is the same as combustion. That looks great, but I feel there is a little white lie in that presentation. This presentation from a biomass company suggests that 38000 km2 are needed to produce all the transportation fuel in the US at 15000 gal/acre. The film suggests 20000 gal/acre, which is close enough, but which obviously means that it's not the total energy consumption in the US that is being talked about. The presentation I link to is a right old mix between units, US imperial and SI, I suppose there's a running joke in biomass circles about that old saying about woods and trees. The presentation also mentions that there's a way to go before 15000 gallons/acre is to be achieved. So like CLC this is promissing technology but not a Utopian solution. I'm really quite pleased with that BOTE calculation now I've seen this, it would definately seem to be close within an order of magnitude. Such a shame that's there's so much less land in some countries than others. If it really was cheap enough to be competative to produce algae-derived transportation fuels, then be sure someone would be doing it. This reminds me of the estimated cost of CO2 capture using CLC, at less than 10€/ton, more sensible estimates at 50 €/ton and the first full-scale CO2 capture plant to look like it's going to get anywhere (OK, not CLC) estimated at about 80 €/ton and finally announced at 200-300 €/ton. I show this not to discredit CO2 capture, but to illustrate the difference between research estimates and actually building something guarenteed to bring a profit. Unfortunately 200 €/ton still isn't really alot of money in terms of production costs compared to other technologies. The coal is coming out of the ground whatever happens. So it better that we have technologies to deal with it. Another reason to consider Fe apart from magnets being ace and magic, is that the multiple oxidation states can be put to some good use in the CLC environment. For example you could also produce a stream of pure hydrogen with a technique called one-step decarbonization. I don't think the number add up on mercury emissions, mercury recovery and mercury production. You are the google wizard, but I can only find 20 tons/yr from the top 50 polluters in the US, and an annual production in the 1000+ tonnes/yr range, with some strata in Spain having 12-14% Hg content. This is not a reason not to reduce mercury emission. My knowledge is sketchy on Hg, but it's almost certain to end up in the exhaust in CLC, the temperatures being too high to form any solid products with Hg in them. Activated carbon would seem to be a useful enough technology. Although that's a lot of product for a small amount of capture. Cost of course is not really the problem. Create a level playing field such that everyone has to reduce emissions to a certain level and industries will complain, but introduce the technologies and we will pay. And I'm willing to pay extra for my energy if it's cleaner. Bocco --- Thanks. As for room to grow biomass for energy, look to the global south. Your cost estimates for CCS certainly look discouraging. All the more reason to leave the dirty, hasty coal in the ground. David - that's what I meant with unfortunately. 200€/ton is only a doubling of the producer price of electricity from coal. Still dirt (pun intended) cheap. At home we pay 5-10 times the cost price, so a lot of people wouldn't really notice it. I would like a mix of energy with a realistic renewable component. Algae don't hit my realism radar yet. It's a scale thing. Even 1km2 is a huge amount of surface area. All my electricity comes from wind farms - and this is only possible (and stable) because other people choose other types of energy. This doesn't mean we're topped out on wind energy, there's room for a lot more, but there is a limit. You can't seriously believe that you could force the global south to go algal (fat chance). That would just make coal cheaper for the rest. We have to do everything, which means savings, renewables, ccs and nuclear to get on top of this problem. Bocco --- I largely agree. Possibly some alae production in the global south will eventually make sense. Just now the push there appears to be either field crops or Jatropha, both for making transportation fuels. Sorry to drag up an old thread, but things are moving forward on the CLC front with this new 500kW demonstration in combination with a coal gasifier. The technology uses a fixed-bed instead of fluidisation, which brings a whole new set of problems to look at, but at least gives the chance at higher temperature, and more importantly high pressure operation.